Radiographs (x-rays) provide dentists of all types and specialists to see things that cannot be seen by the naked eye. All dental x-rays are used with low levels of radiation and are extremely important to evaluate your oral health. Family dentists can view early decay between the teeth and they can observe when bone loss is occurring. Additionally, unerupted teeth can be noted as well as extra or missing teeth. Finally, cysts and tumors are often discovered as they become evident on digital x-ray images. Orthodontists consider a panoramic x-rays (the one that scans the entire lower face) as the most valuable diagnostic tool in orthodontics. The overall dental and periodontal health can be observed as well as root positioning. All children should have a panoramic film by age 7. It shows us when developing teeth need more space to emerge so we can treat most conservatively to avoid the need for extractions of the permanent teeth. 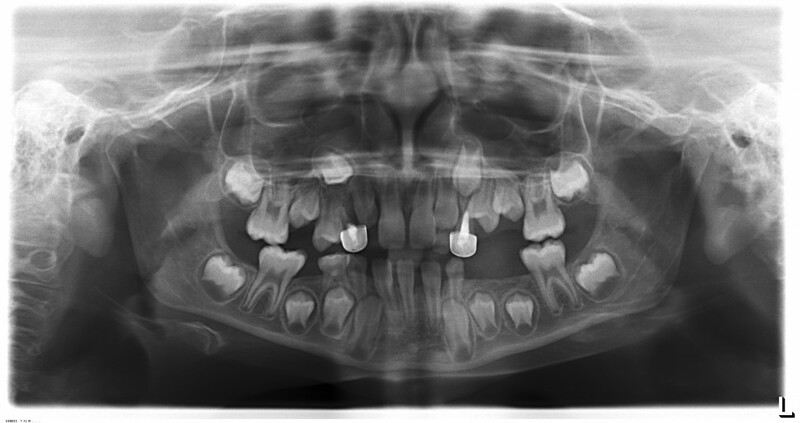 This x-ray (panoramic) shows the need of braces to help create more room for the adult teeth. Finally, orthodontists use a cephalometric (ceph) x-ray which images the head and neck in side view. This image shows us the head and teeth in side view. Most often, growth abnormalities can be diagnosed and often we can plan treatment tailored to correct growth disparities. These treatments are most effective during the child’s growth phase. However, we also have had great success making non-surgical corrections for adults as well. In summary, x-rays help dentists to make the proper diagnosis and then plan the proper treatment for each individual patient.